Like a Movie - Chill Will Da Don New Video!!! Chill Will was born Will Robinson to Shirley and William Robinson on July 4th 1984 in Bryan, Texas. He resided back in forth from Bryan to Houston in his early years before staying permanently in Bryan, TX. he grew up in the toughest neighborhood known as beckstreet. Life wasn’t always great but he had unconditional love from family members and especially his mom. At the age of 9 his uncle James was playn a west coast rapper named "too short" and that was in introduction to rap. Following that shortly his brother blue introduced him to the music of the legendary 2pac Shakur. he fell in love with his music so much he began to write pacs lyrics down and memorize them and from that point he starting writing his own songs. he graduated from Bryan high school in 2002 and attended Tyler junior college to play football and continue music as well. he blew is acl out in a football game in 2003 and soon after gave up football. he always felt like it was a blessing from god and moved to Dallas TX in 2005 with his father to pleasant grove and continued his music. 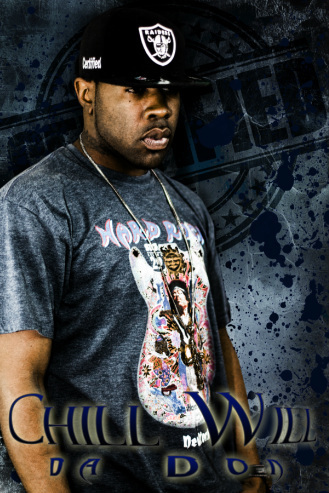 In 2011 chill will has had his first song hit the radio titled "money to blow" on k104 streetswagg Sunday and just released Texas Most Wanted with C Dot Smoka hosted by definition dj butchaboie. His 5th solo mixtape titled Live from Dallas volume 2 was also released in 2011. In 2012 Chill Will released Streetfame which was hosted by 97.9 The Beat's own DJ M Squared. Streetfame featured the single The Good Life featuring Deonte aka Hot Rod and produced by Legacy. Wraping up 2012 was a collaboration album featuring label mate C Dot Smoka entitled Late Nite Muzik: The EP. In 2013 Chill Will began to work on the next album The Saga Continues. With over 100 tracks recorded, there was a lot of anticipation building for the release of the album. The first single was entitled This Feelin featuring C Dot Smoka and produced by D Boi Beatz. The album featured other producers like Legacy, Kiese on Da Track, and KC3D. The album was released in May of 2013. Shortly after the release was the second single entitled Her Preference featuring Piston produced by Kiese on Da Track.